I missed a lot of food events recently and I didn’t want to miss JFI-Jaggery as well. Ever since Kay announced the ingredient for this month’s JFI along with a request for new recipes, so many ideas flashed by and I thought I could make atleast two recipes. But thanks to time, I managed just one. 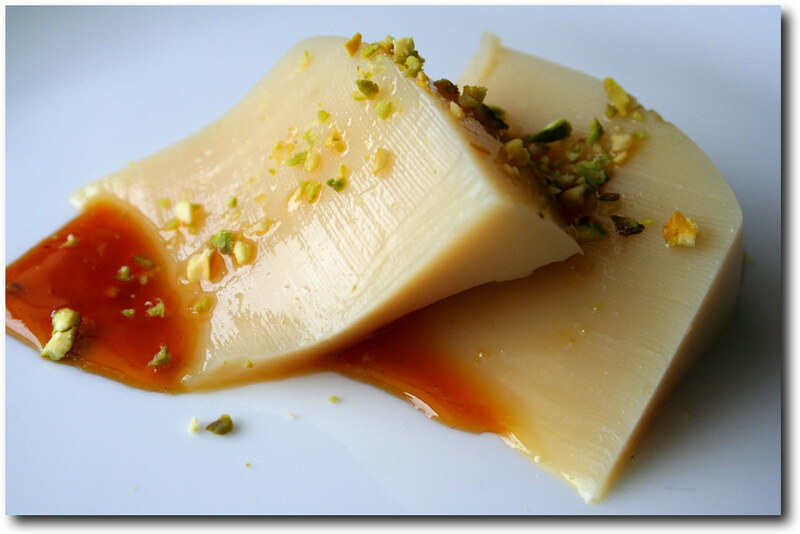 Blancmange pronounced bluh-mahnj is a classic jelly dessert which originated in Arab world, and was typically made of almond milk, though in recent days, milk has taken its place. In its basic form, it is a pudding gaining its consistency from corn starch and sweetness from sugar. Boil half of the milk. In the other half, dissolve the jaggery and strain to remove impurities. Add the corn flour and stir without any lumps. Finally add the lemon zest. Add the boiled milk to this jaggery mixture and stir well. Return it to heat and keep stirring on a low heat. In about 5 to 10 minutes, the milk will attain the consistency of a porridge. To test doneness, dip a spoon into the milk and draw a line using your finger on the back of the spoon. If the line stays clear, the blancmange is done. Pour into a mould which is wet and refrigerate. It usually takes about one and a half hours for the blancmange to set. Unmould, and serve with cream, fresh fruits, nuts and a syrup of your choice. Combine all ingredients and cook on a low heat till the juice thickens. Instead of orange juice, you can use any juice. My favorites are black currant, apple and grape. I moved to Blogger Beta on Nov 11th and I must say that it went on without a hitch. The only drawback though was that comments left by non-beta-bloggers showed up as ‘Anonymous’. I am pretty sad about it because, I have no way of identifying the authors who had spent much time and effort to leave comments during the past months. But I am hoping that as non-Beta- Bloggers start moving their blogs to the new version, this problem would be resolved. Till then, my humble request to all of you is to include your name in your comments. That way, I can never lose track of you no matter, which Blogger version you are using. I am moving my blog to the new Blogger Version. I am not sure how my template will change or look like. But I hope to get it back to its original form. See you all soon! It feels so nice to be missed and that’s what I infer from the comments left by my foodie friends…I apologise for keeping quiet for so long. I have been a little busy lately and have been feeling a little under the weather too. Added to this, I had my share of blogger and PC problems to deal with. But when I saw all your comments, rain or shine, I had to post. So, here it is. This recipe is a classic from my Dh’s grandma…The grand old soul is so good with cooking and even at this age, she makes sure she cooks everything by herself when her beloved grandchildren stop by… May God Bless her and keep her hale and healthy for a lot many years to come! 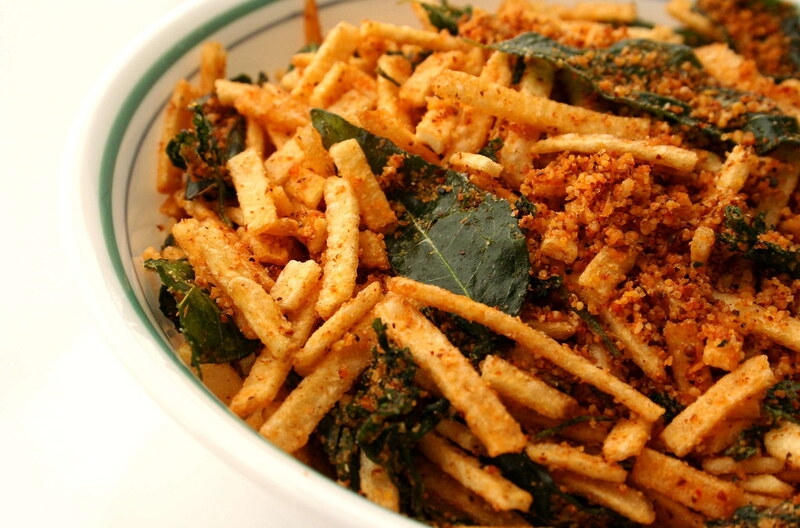 Mix the roasted and fried ingredients and grind to a fine powder. Heat oil in a pan and add curry leaves and coriander. Fry till they wilt. Next add the ground powder and fry for a while. Take care not to burn the powder. Next add the potato sticks and stir gently over a low flame till well blended. This should take about 2 to 3 minutes. Potato sticks curry is ready! This dish makes a yummy accompaniment for rice. Mix it with plain rice with a drop of ghee or use it as a side dish. Wash and peel potatoes. Grate them with a grater which will give you thin, but long strands. Keep the gratings soaked in salted water till you are done with all the potatoes. Wash the gratings with water to remove some of the starch. Squeeze and let dry for sometime. Use paper towels or spread it on a plate to remove the excess water. Once they are considerably moisture less, fry them in a wide pan and keep aside. Potato sticks are ready. Potato sticks by themselves are a snack and it looks like I have given two recipes in one post!